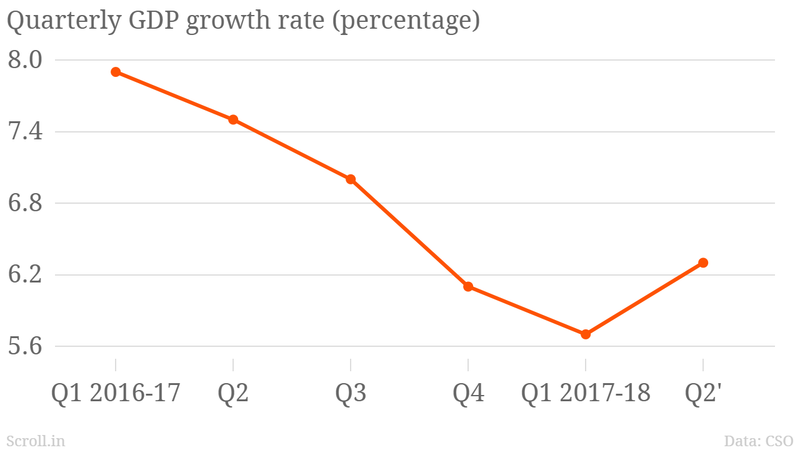 India's GDP growth rises to 6.3% for the 2nd quarter of 2017-18. The latest GDP data released on 30th November 2017 shows a turnaround in the economy for the July-September quarter. 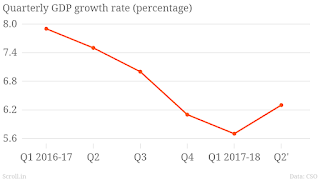 The GDP grew 6.3 in the second quarter, which is 0.6 percent higher than the first quarter growth rate of 5.7 percent. In July-September, manufacturing, and electricity production increased substantially. Manufacturing growth rate jumped to 7 percent.Mining came in at 5.5 percent. Electricity, gas, water supply and utilities grew at 7.6 percent. Construction growth picked up by 0.6 percent to clock a rate of 2.6 percent. Trade, hotels, transport, services increased by nearly 10 percent.However, the growth rate of agriculture sector came in at 1.7 per cent which is a matter of concern. Government believes that the Growth estimates could rise further after adjustments with complete data. The GDP results indicate that companies have adapted well to GST. Rating agency Moody's had earlier this month raised India's credit rating and indicated the Indian economy would grow by 6.7 percent this financial year, which would increase to 7.5 percent in 2018-19. All in all, the government's economic management is seeing results, on every level and is likely to see a further up tick in the coming days.